When most people think about Head Start Programs, they think about early childhood learning and education for low-income families. And while it’s true that Head Start is an educational community service that millions have counted on since the program was first launched, the nutritional services of Head Start are just as important. It is the cooperative effort between education and quality nutrition that makes the Head Start Program so successful in the communities where it is needed most. Head Start administrators work together with staff and participating families to identify the nutritional requirements of each child. This helps the program and the parents learn what each child needs based on the height and weight of the child, cultural preferences, allergies, health problems and disabilities. They don’t just identify what each child needs, they educate parents on how to properly feed and care for their unique child based upon his or her personal data, not some national chart or scale. Each Head Start Program must implement a nutrition program that meets the nutritional requirements and feeding needs of each child. This includes children that have disabilities or require special dietary assistance. The nutritional services at Head Start must serve a variety of different foods, taking into consideration the ethnic or cultural preferences of the child, as a means of broadening each child’s food experience and willingness to try new things. 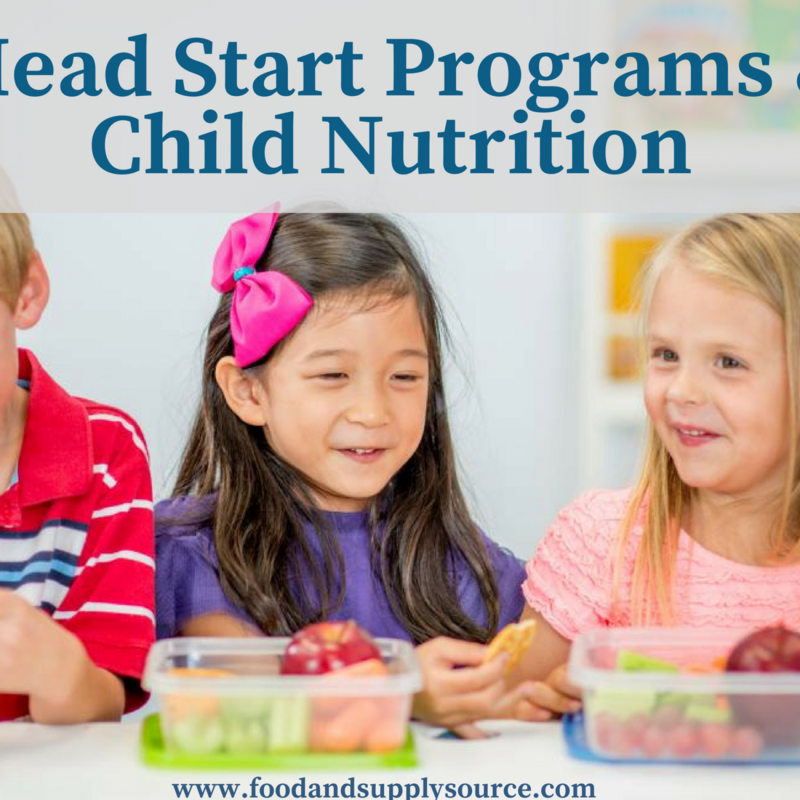 The nutritional portion of the Head Start Program is funded by USDA Food and Consumer Services Child Nutrition Programs, however additional Head Start and Early Head Start funds may also be used to cover any costs that are not provided by the USDA program. Head Start administrators are required to provide meals and snacks that account for one-third of the child’s daily nutritional needs for part-day services and one-half to two-thirds of the child’s daily nutritional needs for full-day participants, based on the length of the program day. Breakfast is provided to children participating in morning center-based programs that did not receive a breakfast at home prior to arriving at Head Start or Early Head Start facilities. The Head Start Program is not just limited to school age children. Early Head Start administrators work with families to identify nutritional requirements for infants and toddlers as well, providing education for the family unit as a whole. Discussions about current feeding schedules, the types and amounts of food that are provided, meal patterns and even how to introduce new foods can help new or struggling parents meet their child’s needs through the program. Other areas of discussion and education include food intolerance and preferences, dealing with food waste, proper portioning, voiding patterns and specific observations as they relate to developmental changes in the feeding and nutrition of each child. Early Head Start administrators share this information with parents and update the nutritional requirements of each child served by the program as he or she grows and develops. The primary group in the Head Start Program would be the three to five year old set. The children who participate in this program must receive the types of food and the quantities of food that are recommended for the minimum standards of meal patterns according to the USDA. Foods must be served to children in this group that are high in nutrients, yet low in salt, sugar and fat, to help build healthy habits that will hopefully last a lifetime. An appropriate schedule of meal and snack periods in Head Star Programs must be set to ensure that the needs of all individuals participating in the program are being properly met. For three to five year-olds, this can be on a set daily schedule around educational and play activities at the center, however for infants and young toddlers, this schedule might be more of an on-demand or case-by-case situation. Appropriate snacks and meals must be provided during group socialization activities and good dental hygiene must also be promoted in conjunction with these meals. When it comes to providing meal services to participants and their families through the national Head Start Programs, administrators must also ensure that nutritional requirements and socialization requirements are met. This means that a variety of different foods must be offered in order to broaden the child’s food experiences. Each child should be encouraged, not forced, to taste or try the food that is being offered, taking care that food is never used as a reward or as a punishment. To build healthy eating habits, all toddlers and preschool children who participate in the program will eat “family style” with classroom staff and volunteers, sharing in the same menu as nutritional and dietary requirements allow. Opportunities should be provided for children to help with basic food preparation and nutritional education whenever available, including basic food safety and sanitation, understanding portion control and other food-related activities. FoodSource Plus is a free service that provides a free cost analysis and offers group purchasing power to Head Start administrators and other human service programs. Following the free cost analysis, FoodSource Plus works with nutritional services at Head Start to meet USDA requirements, while focusing on reducing waste, smart purchasing, bulk purchasing and portion control to meet the individual nutritional requirements of each child and family participating in your Head Start Program. For more information, or to schedule a free cost analysis, contact FoodSource Plus. Visit our website and use our online contact form or give us a call at 866-248-4520 and get started improving on your nutritional services for Head Start today!